Time to sell your Island Sunrise condo? Read about today's resort-market condo buyer. 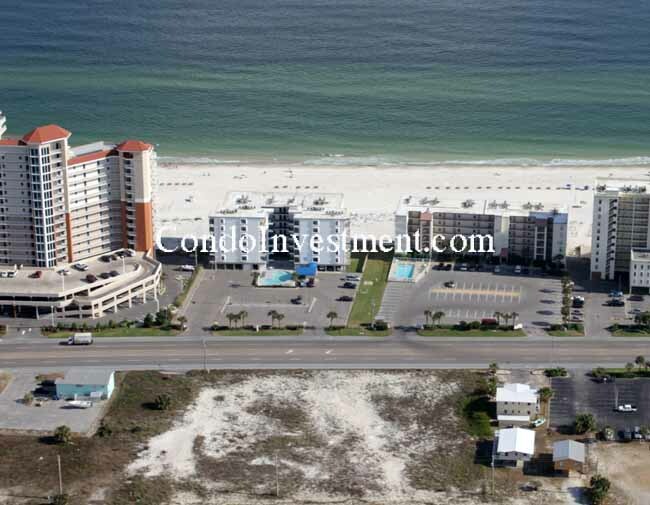 Island Sunrise condo development was built in 1982 and is located directly on the Gulf of Mexico. It was built during the building explosion following devastating Hurricane Frederick in 1979. 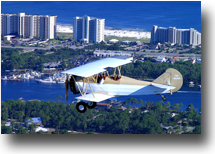 Island Sunrise is located approximately half of a mile east of Highway 59 in Gulf Shores, Alabama and next to the Island Shores condominium. This building offers one- and two-bedroom units (with views varying between a direct gulf-front view and indirect views). The units are slightly larger than Island Shores, and offer a more traditional floor plan than the galley-style units next door. 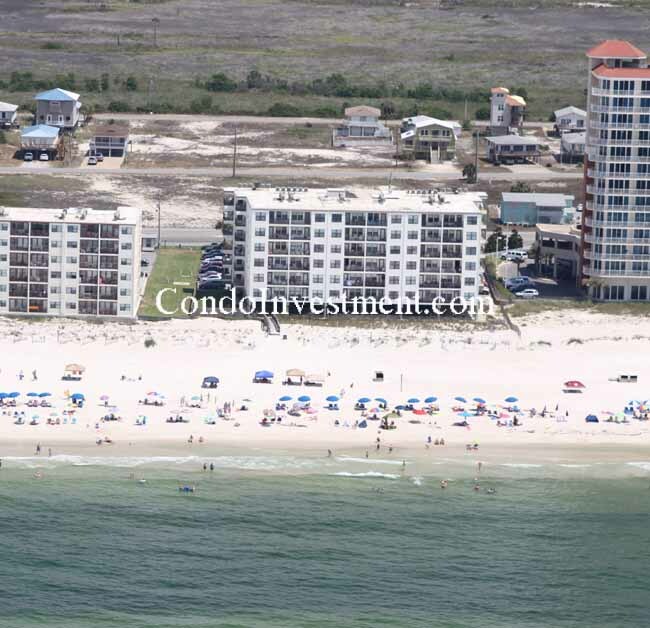 Island Sunrise was designed with slightly smaller and affordable units and is one of the top three or four least expensive gulf-front complexes to buy into. It is a great rental complex and offers its owners a great opportunity to earn some extra income by renting out the unit. 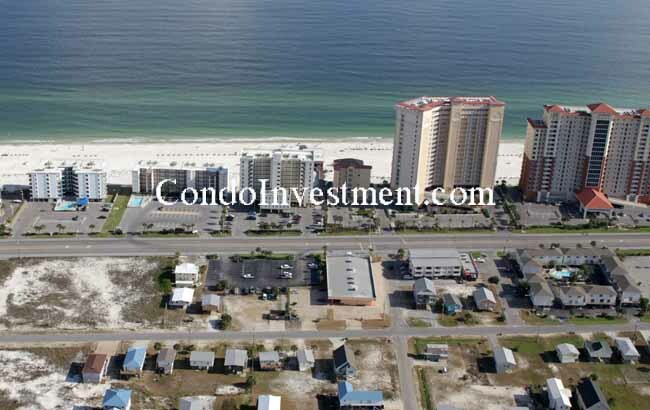 The complex offers a convenient location, within walking distance to many restaurants, shops, and other venues, including the Gulf Shores State Park fishing pier. The complex offers an outdoor pool, BBQ area, and a covered area under the building with swings and picnic tables to escape the summer heat. 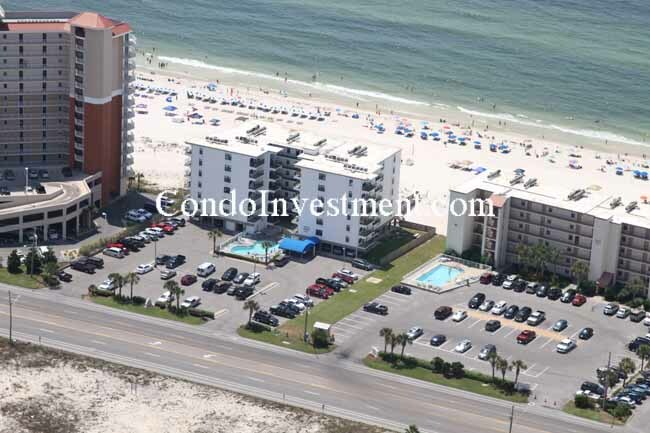 Please let us know if you would like further info for Island Sunrise or any other condos, homes, or real estate along the Gulf Coast or would like to schedule a private viewing by emailing info@condoinvestment.com or by calling (251) Area-Pro (251-273-2776) for immediate assistance. Use our RENTAL TIPS guide to increase your Island Sunrise rental income. 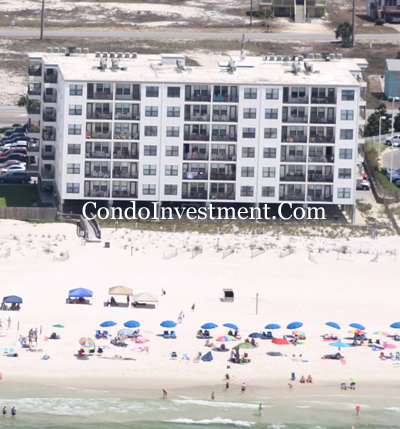 Find annual rental revenue numbers for Island Sunrise and all other Alabama Gulf Coast condos. Above, Island Sunrise is the far-left condo (Eastern-most). To the right is Island Shores condominium and Boardwalk condominium. Next, Sea-n-Suds gets things interesting being a pier/bar and restaurant separating Boardwalk from the two parts of Seawind condominium. Finally, West (right) of Seawind is San Carlos condominium. The Lighthouse condominium's Western parking levels are partially shown with Island Sunrise near the center of the photo. In the right half of the photo, Island Shores is shown along with the Eastern half of Boardwalk. Aerial view of Island Sunrise's Southern exposure for above the surface of the emerald green waves from the Gulf of Mexico. 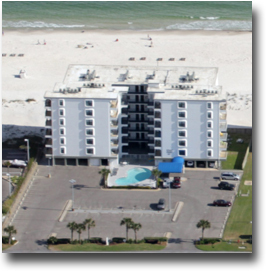 Click here for aerial photos of Island Sunrise condominium in Gulf Shores, AL.